“You know, I really look better in candid photos”, or “I really don’t like posing, I always look so unnatural”. I hear some variation on this statement regularly. For a lot of people, the idea of “posing” for a picture brings to mind a lot more bad-gradeschool-picture-day feelings, and a lot less GQ-centerfold feelings. 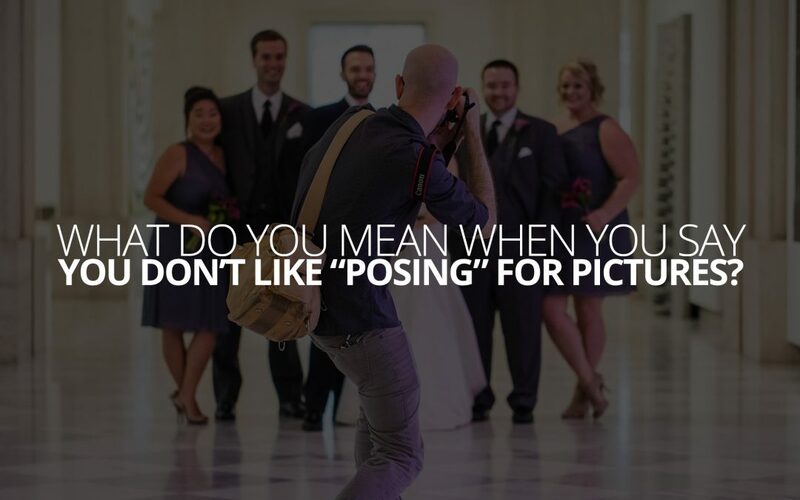 I think most people just don’t have very many positive experiences being ‘posed’ for a photo. In the social media age, your favorite photo of yourself is a lot less likely to be professionally taken. It’s more likely that your favorite photo is one from a hike or a party or some other outing. It’s probably taken with a cell phone, and the person who took the picture probably just happened to capture the angles that flatter what you like about your appearance, and hide what you don’t. There’s nothing wrong with that of course, except that it might be reinforcing an unfair appraisal of your physical appearance. Let me tell you a story about a couple I worked with a few of years ago, Tim & Alison. Tim was shy in front of the camera, and Alison had only two kinds of experiences with photographers: department store photographers, and school photographers. She really didn’t like the idea of “posing” for pictures, so I promised to take a light touch during our session. I started by giving them some very general instructions to stand near one another. I asked Tim to sweep Alison’s hair behind her ear, and I snapped a photo. Then I asked them to walk over to a picnic table a couple hundred feet away, and told them I’d catch up with them in a moment; I snapped a few pictures as they walked away. When I met back up with them, they were standing near a tree talking, and it looked really nice with a bridge in the background, so I explored some angles without interrupting them. Then I thought, it would look great if Tim pulled Alison in a little closer, so I gently interrupted and asked him to pull her in a little bit, and he did without really stopping their conversation. Then, I thought it’d look better if Alison brought her hand up to her neckline as they were talking. So, again, I gently interupted and asked her to bring her hand up to the collar on her shirt. This time, Alison paused their interaction to follow my instructions. She did perfectly, and I explored some angles as they shared a moment collecting their thoughts about where they left off. Taking a few steps back, I wanted to get some full length images in this spot, so I interrupted again, this time both of their attentions snapped over and they engaged with me. I asked Alison to throw one foot over the other, and I asked Tim to slip his finger through one of her belt loops, as if to help her keep her balance. The two were getting into it now. Not only did they follow the instructions like champs, they felt the humor and emotion in it, and they played along. Then I noticed that Alison had her wrist turned in an awkward way on Tim’s shoulder, so I asked her to switch it, and I had Tim shift his weight onto his other foot. Like champs I tell you. We had a great time that afternoon, and I’m still not sure they realize just how much ‘posing’ we did that day. What became clear to me early in the session was not that they didn’t like ‘posing’, per se. But that they don’t like having orders barked at them, they don’t like feeling uncomfortable or awkward and having no idea why, and they don’t like feeling like they’re doing it wrong. Basically, they didn’t like being posed badly. Tim & Alison found a lot of photos from their session that they really liked, and they had a bunch of them printed and displayed during their wedding, so we must’ve done something right. But the thing is, Tim & Alison aren’t really unique in this way. Virtually everyone who tells me they don’t like being posed are really saying something like Tim & Alison were saying. And virtually every one of them goes through the same process during their shoot. We start with a light touch, then gradually turn up the instructions as they start to relax and play along. And that is really what I’d like to leave you with this week. Posing for a photo is little more than simply playing along with your photographer. You’re playing a game together. Your photographer throws out an instruction, and you interpret that instruction the way you see fit. Then they throw up another instruction, and you do it again interpreting it into something that’s distinctly you. This is how the photographer can refine down a pose naturally and organically, and in an entertaining way. And, it’s why being posed by an unskilled or misguided photographer feels so crappy—you both have to play the game together for the best results. The next time you feel anxious about posing for a photo, take a deep breath and realize it’s a game. Just play along, and you’ll be doing your part perfectly.